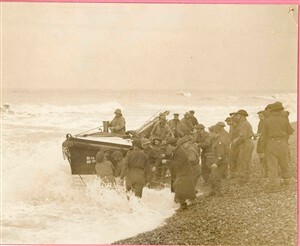 Lifeboat with service personnel in wartime, c1939-45? Lifeboat on the Yare, c1910s? Can you help us to identify the boats featured on this page? My hunch is that the first photo was taken in wartime. Could it be the Louise Stephens, which served as the RNLI's Gorleston lifeboat between 1939 and 1967? 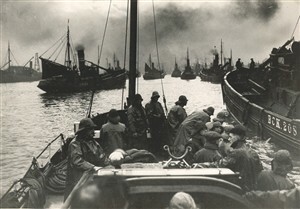 As for the second photo, what an atmospheric scene of dark skies and Scottish herring drifters, taken from a boat (a lifeboat?) making for the mouth of the river one early autumn morning?! Mr Peter Stibbons of Poppyland Publishing has identified the first lifeboat as the Forester Centenary, a Liverpool class boat, on the shingle at Sheringham! It was not unusual for troops stationed locally to help to launch and recover the boat. He suggests that the date may be the 1920s.